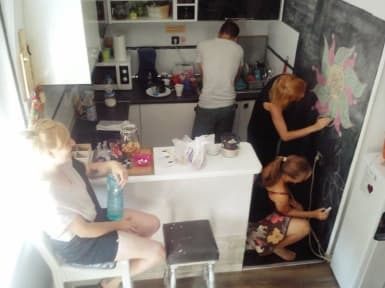 In the heart of Belgrade where you can come across on long history also you can find one hyistorical house with garden who turns into Hostel to provide world travelers best place to stay and feel the vibe of surrounding. All rooms have view on fortress and quck ascess to the main pedestrian street. Big living room, fully equipped kitchen and frendly stuff make you feel like at home. Here you can try tradicional brandy rakia, free coffe and tea, hear useful advice how to save and make fun in our city also walking tours are free,, We are just few stops from the main bus and main train station. About rooms: You know that feeling when beds are too comfortable and rooms are cozy, big lockers ,maps, tastefully designed interior, fresh towels and linen. When you open the window, sometimes you can hear distance music from partyes on the river but also sounds of birds from Kalemegdan park, in rare cases you can hear wolves from zoo garden. 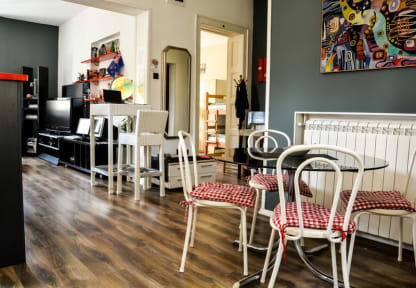 But, if you manage to separate from all this and step out from hostel, adventure will immediately continue on streets of our beautiful city, because we are surrounded with all famous attractions of Belgrade. P.S. We also accept your bicycles and motorcycles, and we take care about them too. GREAAAAAT ! The staff is super super nice. I had never seen before an hostel so clean. I recommend !